Is everyone ready for a national championship game between Notre Dame and an SEC team to be named later? Because barring some major upsets that’s what we are all going to be watching on Jan. 7. And for the second year in a row the title game match up will underscore how badly college football needs a real playoff system. First off is Notre Dame, which is probably the biggest lock this weekend to “earn” a spot in the title game (unless anyone really feels strongly about redshirt freshman Max Wittek at quarterback for USC). It is essentially irrelevant that the Irish most certainly don’t deserve a spot in the title game – unless you think a schedule full of the likes of Navy, Pittsburgh, Boston College and Wake Forest is a test of a championship team. Notre Dame is a legacy school and when you go undefeated you get a championship slot handed to you (see Ohio State circa 2006 and 2007). And that’s the first problem. There needs to be a path for every school to make it to the title game (like in college basketball), not just the members of the privileged class. For the other side of the game, the favorite is Alabama, although they have a tougher road to travel than the Irish. The Crimson Tide still has to get past in-state rival Auburn and then third-ranked Georgia in the SEC Championship game. Alabama is probably the best team in the country, so this isn’t a knock on them, but the fact that the Crimson Tide has a path back to the national title game for the second year in a row with one loss highlights the other problem with the current system. Basically, it comes down to Alabama’s one loss essentially not counting in the eyes of the BCS machine, while other teams are not afforded that same luxury, except for Georgia; if the Bulldogs win out they are most likely in the title game. A week ago, Kansas State and Oregon were undefeated and ranked No. 1 and No. 2 before each loss. Now, no one outside of Manhattan, Kan., thought the Wildcats were anywhere near being the best team in the country (and that was confirmed by K-State’s loss to Baylor), but if Oregon was the second-best team before an overtime loss to Stanford, how are the Ducks still not in the conversation for the national title? Why does Oregon’s loss count and Alabama’s does not? And is there anyone who doesn’t think that the Ducks or the Crimson Tide would be heavy favorites against Notre Dame? 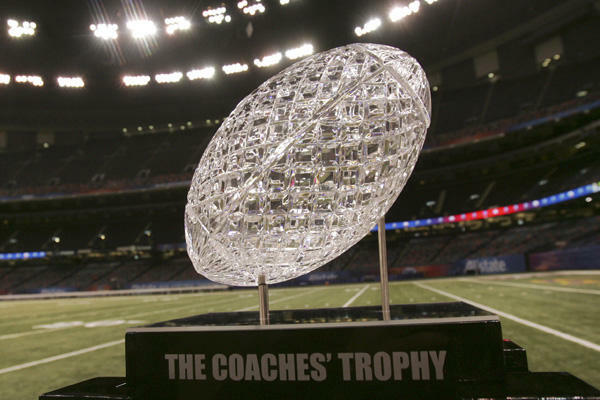 Overall, the BCS is better than the old system, but it will never be as good as a true playoff. And college football fans are worse off for it. 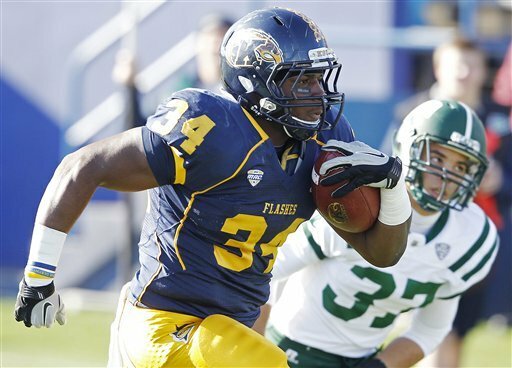 Congratulations to coach Darrell Hazell and the Kent State Golden Flashes, who finished off a perfect MAC season with a 28-6 win over Ohio on Friday. “This was another great win for us,” Hazell said. “Even though we didn’t play as well as we would have liked to on offense, we came away with a big win and finished 8-0 in the conference, which has never been done before here. Our defense played phenomenally. The Golden Flashes (11-1, 8-0 in the MAC), clinched their first East Division title a week ago, will now face Northern Illinois (10-1, 8-0 in the MAC) in the conference championship game in Detroit next week. Kent State is the first team in the East Division to go undefeated since Miami (Ohio) in 2003. They are also 5-0 at home for the first time since 1956. They have now won 15 of their past 17 games and their 16 wins over the past two seasons are as many as they had total from 1989 to 2000 – a time span that included the three years we covered the football team for the Daily Kent Stater. As good as the Golden Flashes have been playing during their 10-game winning streak, there is one area that has us worried. During the winning streak Kent has converted just 34 percent on third down (44of-131) , and that number drops to 27 percent over the past four games (12-of-44). Ohio held Kent to just 3-of-11 on Friday and also kept running back Dri Archer under control for the most part (53 yards rushing and 58 yards receiving). Trayion Durham did run for 97 yards and a touchdown, but if Kent can’t get the running game going, their continuing struggles on third down could derail their dream season. Probably the less said about Liverpool’s draw with Young Boys in Europa League play the better. It looked like the Reds had secured a spot in the knockout stage after Joe Cole’s goal at the 72-minute mark, but Elsad Zverotic’s equalizer with two minutes left means Liverpool needs a win on Dec. 6 when they travel to take on Udinese for the final match of group play.